These are a set of 12 mini generic wrestlers who happen to look just like actual WWF wrestlers from around 1990-91. They were sold in packs of six. These guys stand about 2 inches tall. 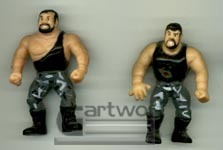 I've recently begun seeing these figures on eBay with different paint jobs, so maybe they've ben re-released. well, I'm not sure who he's supposed to be.